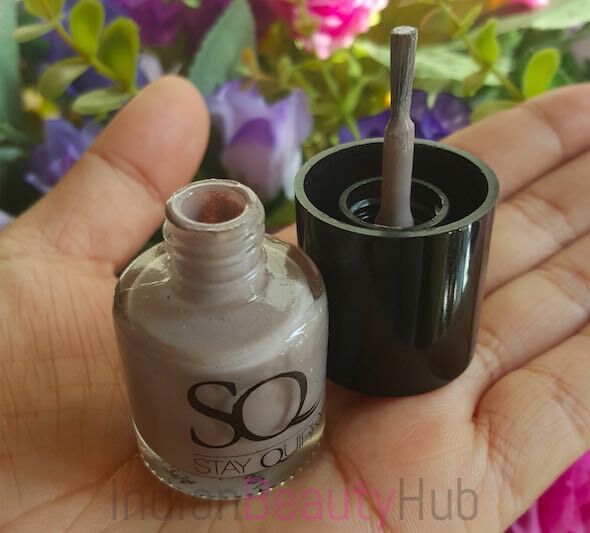 Hey everyone, today I’m reviewing a textured nail paint from a new brand named Stay Quirky (SQ). SQ offers a wide range of nail paints with a glossy, metallic, glittery, gel and granular finish. I recently bought two shades online from Purplle.com and really liking them. The shade I’m reviewing today is Stay Quirky Nail Polish Polishdry Effect Annoyingly Gorgeous 754. Packaging: Stay Quirky Nail Polish comes in a broad glass bottle with a black cap. A medium length brush applicator is attached to the cap. 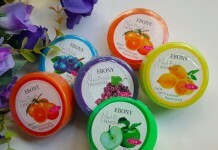 The transparent packaging allows seeing the nail paint color. 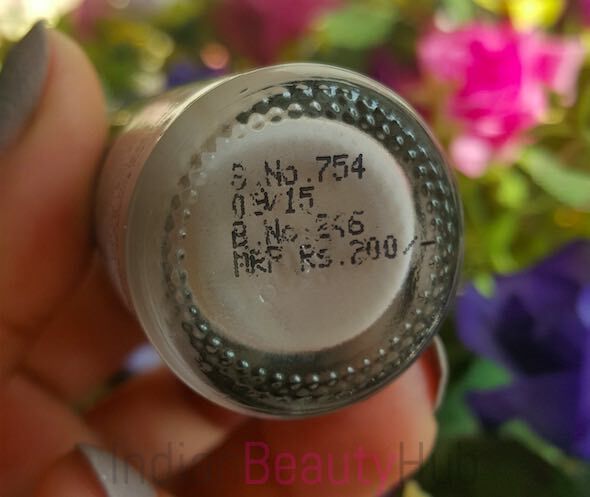 The shade name is not given anywhere on the bottle and only serial no.745 is mentioned at the bottom of the bottle. Overall the packaging is compact, sturdy and you can easily carry it while traveling. 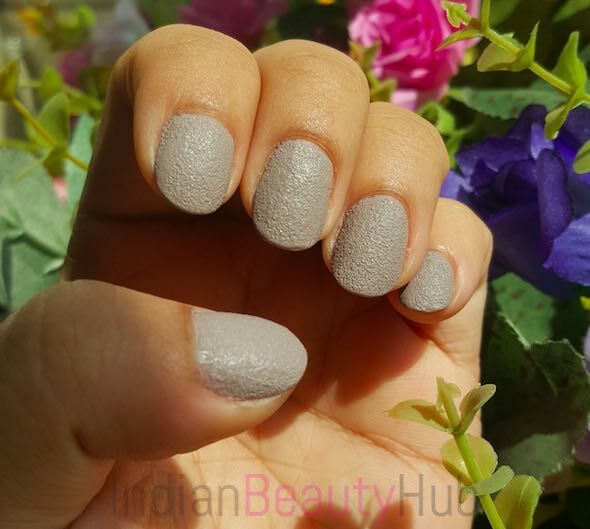 Texture: This nail paint is from the Polishdry Effect range and has a granular texture. It has a perfect consistency neither too thick nor runny. It spreads easily on the nails without much effort. It has a strong fragrance like other nail paints. 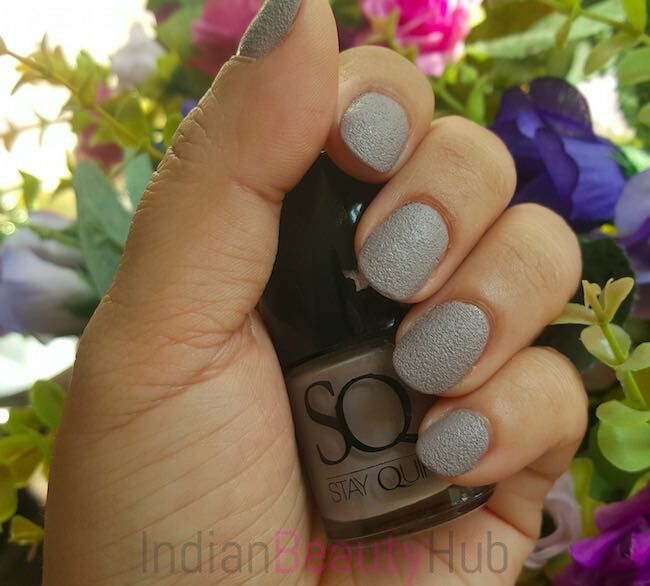 Price & Availability: The price of the Stay Quirky Nail Polish Polishdry Effect Annoyingly Gorgeous is Rs.200 for 8ml (I bought it for Rs.130 from Purplle.com). You can buy Stay Quirky nail paints online from Purplle.com. Efficacy: The shade Annoyingly Gorgeous 754 is a beautiful grey color with blue undertones. The applicator brush is of good quality that helps to spread nail polish evenly on the nails without streaking. 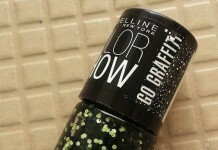 It has good pigmentation and goes completely opaque with 2 coats. It dries pretty fast and imparts a nice granular matte finish on the nails. It stays on the nail for 4-5 days without chipping or fading. 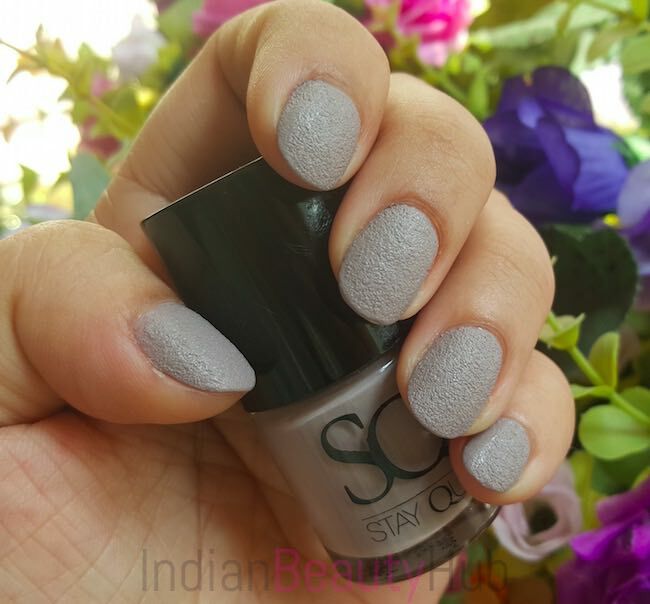 I totally loved this shade and it is so pretty that it can be used all around the year. This particular shade will suit more on the fair skin as it makes my hands look a little dark but I really don’t mind that. There are so many color options available to choose from. A wide range of shades and textures is available to choose from. 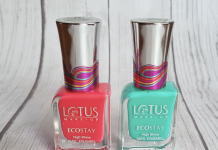 Has good pigmentation, dries fast and stays on the nails for 4-5 days. You can buy these online from Purplle.com. SQ nail polishes are 100% vegetarian & vegan and are not tested on animals. The shade name is not given on the bottle. Offline availability might be an issue as I have not spotted these in the local beauty stores. 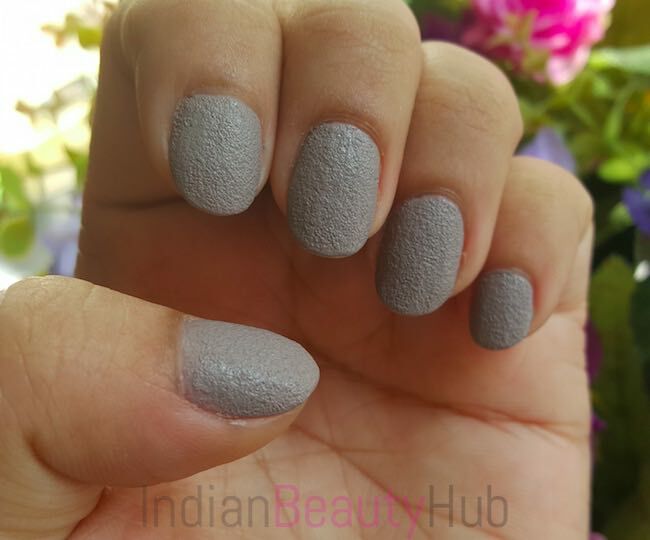 Overall I'm in love with this gorgeous textured nail paint from Stay Quirky. 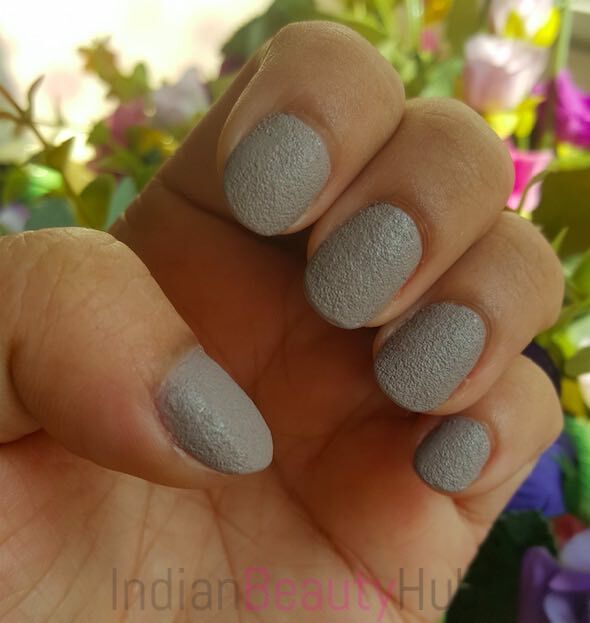 It is a beautiful grey color that dries fast and leaves a matte granular effect on the nails for long. Various shade options are available to choose from. Highly recommended! Is it easy to take it off? Does it make the nails brittle?